ARLINGTON, VA--(Marketwire - April 20, 2010) - EADS North America announced today that it intends to submit a proposal on July 9, 2010 for the U.S. Air Force's tanker modernization program and will offer the KC-45 -- the most capable, American-built solution that is flown, proven and in production now. EADS North America is progressing in discussions with potential U.S. partners to build a winning team in order to provide the most capable, best value solution to the Air Force. The KC-45 is the only aircraft flying today that meets the U.S. Air Force's tanker requirements as outlined in its KC-X Request for Proposal (RFP). The KC-45 builds on the EADS-based tanker that was previously selected in 2008 by the Department of Defense and that has won the last five consecutive tanker competitions worldwide. "We will offer a modern, more capable tanker in response to the Defense Department's decision to encourage competition for this major taxpayer investment," said EADS North America Chairman Ralph D. Crosby, Jr. "Our KC-45 is the only real, flying, low-risk solution that today meets the demanding Air Force air refueling requirements and is actually in production now. That fact is critical because our warfighters deserve a true best value solution." EADS North America will build and modify the KC-45, along with A330 commercial freighters, at an EADS North America/Airbus production facility to be constructed in Mobile, Alabama. The KC-45 program and aircraft production/modification center will create and support tens of thousands of high-value American jobs while making a long-term investment in the nation's economy at a time when other aerospace companies are outsourcing production overseas. "This tanker competition is all about the warfighter and the aircraft that most successfully meets their requirements. The KC-45 offers what the Air Force needs today: a modern military tanker that is in production now with deliveries beginning this year," said Sean O'Keefe, EADS North America Chief Executive Officer. "Not only does the KC-45 offer the best value and a huge capability advantage over the competition, it also will support tens of thousands of jobs across America by expanding our nation's industrial aerospace capacity." The KC-45 is the U.S. military version of the proven A330 Multi Role Tanker Transport (MRTT). To date 28 aircraft have been ordered by four U.S. allies. The MRTT has transferred more than 265,000 lbs. of fuel to a range of military aircraft -- from F-16 and F/A-18 fighters to the E-3 AWACS -- using the same refueling systems offered on the KC-45. "Our aircraft has demonstrated its unparalleled capability by refueling a variety of military aircraft utilizing both boom and hose and drogue systems, as well as by operating in the receiving position. That's a statement our competition can't make," said Crosby. The Royal Australian Air Force will receive the first A330 MRTTs later this year. Additional aircraft are in production or undergoing mission-equipment outfitting for the United Kingdom, Saudi Arabia and the United Arab Emirates. "We're progressing forward in discussions to expand the ranks of our nearly 200 current U.S. suppliers, some of which are joining us for today's announcement," continued O'Keefe. At the heart of the KC-45 is the most capable aerial refueling system operating today. The aircraft's fly-by-wire Aerial Refueling Boom System (ARBS) has a demonstrated fuel offload rate of 1,200 U.S. gallons per minute -- the only system which meets the U.S. Air Force's requirements without further modification. The system's proven all-electric fly-by-wire technology ensures enhanced controllability and safety that greatly aids the boom operator and receiver aircraft's pilot. The KC-45 also carries an all-digital hose and drogue system for probe-equipped aircraft. The under-wing refueling pods are the most modern in service today, with the capability to deliver up to 420 gallons of fuel per minute through 90-ft.-long hoses at refueling speeds from 180 to 325 knots. The KC-45 will also feature a modern fuselage refueling unit, common with that of allied MRTT users such as the United Kingdom. 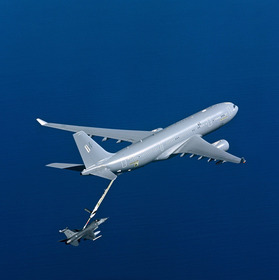 The A330 Multi Role Tanker Transport, on which the EADS North America KC-45 is based, refuels an F-16 fighter with its fly-by-wire, all-electric advanced Aerial Refueling Boom System.